For me, this is ultimate comfort food. I normally serve this with a crisp green salad and garlic bread. Even my meat-eating friends love this! I normally make my own tomato sauce from scratch, but if you are really pushed for time, I find that using a pre-made tomato pasta sauce normally works really well too! I use gluten-free breadcrumbs, which you can get from here: Healthy Supplies. Now this is not the healthiest of dinners, but it doesn’t pretend to be! There is a fair bit of cheese but that is the point of this dish. Now the name implies that you are supposed to use Parmesan but as I am a strict vegetarian – this is a no-no for me. So I have used a strong mature cheddar instead! If you want to reduce the cheese – feel free to do so! I normally use half fat cheese! To make your sauce, start by heating your olive oil in a pan. Add your onion and celery and cook until translucent. Add your garlic and mushrooms and continue to cook for a few minutes. Add the tinned plum tomatoes, herbs, bouillon powder, salt and pepper and simmer on low for at least 40 minutes. Simmering for this length of time is SO important in ensuring you get a lovely thick, flavoursome sauce. 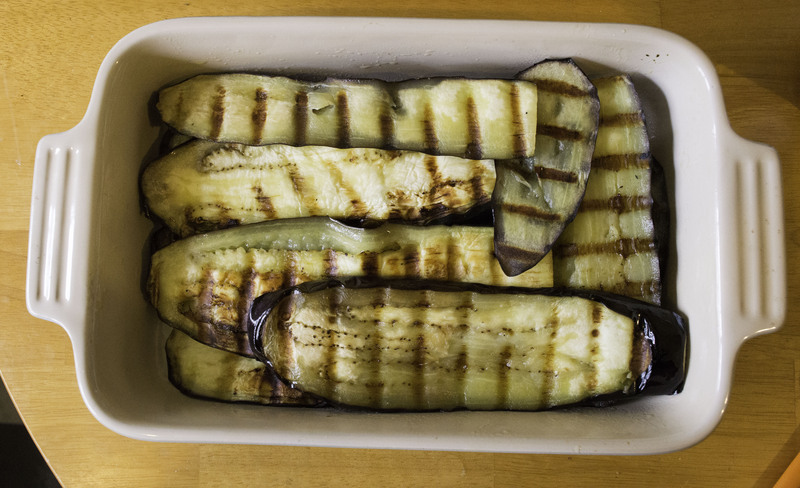 Slice your aubergines into long strips and brush with olive oil. Grill these slices on a griddle or pan fry until cooked. I use my George Foreman grill. Arrange your slices in an oven proof dish (as seen in the picture). 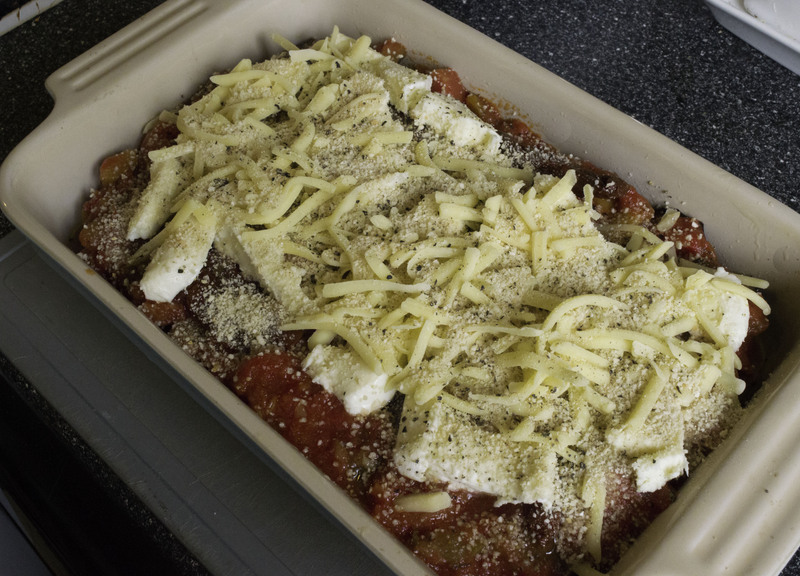 Pour over your tomato sauce and top with shredded mozzarella, parmesan, cheddar cheese and breadcrumbs. Season the top with a sprinkle of salt and cracked black pepper. Bake for 30 minutes or until the top is crispy and golden brown. 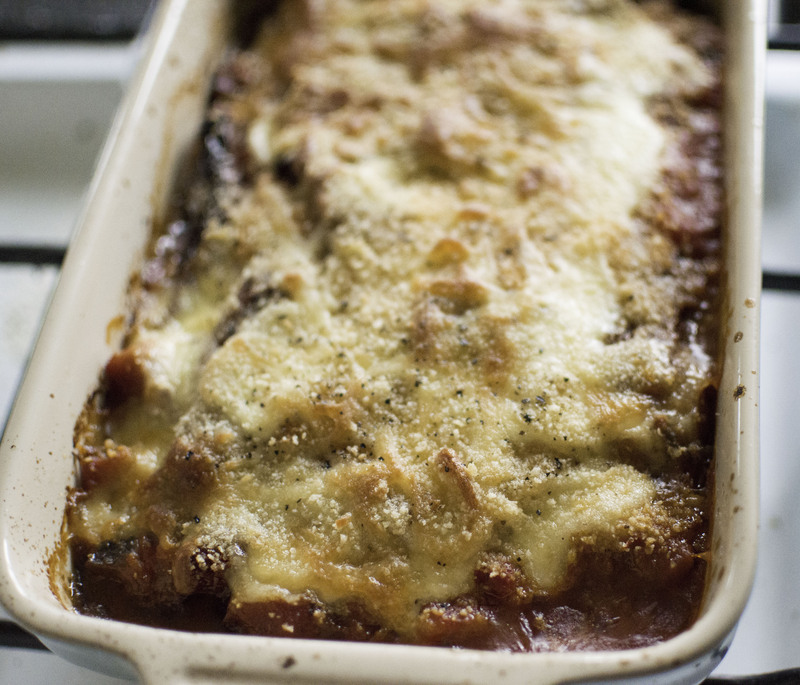 I normally allow mine to cool for about 5-10 minutes and then serve with a crisp salad and some garlic bread (if you are feeding a hungry crowd!). Nom. Go forth and devour! Happy Sunday everyone! 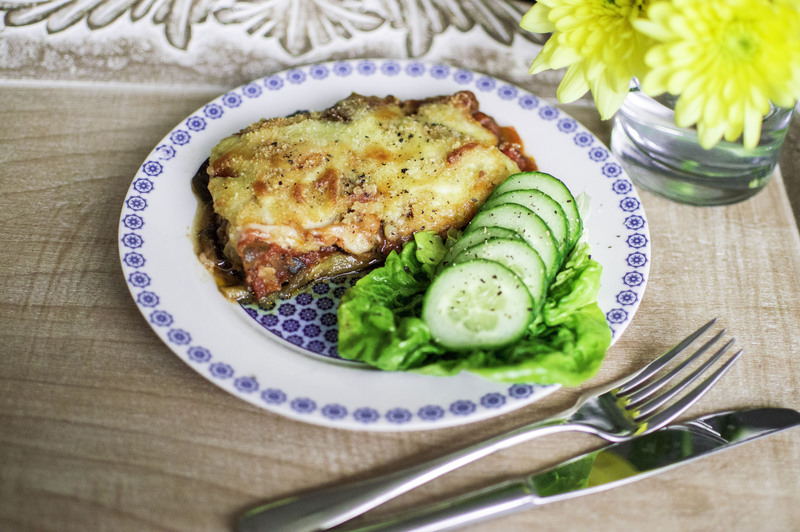 Posted on May 10, 2015 January 7, 2016 by TinaManahaiPosted in RecipeTagged 2015, aubergine, baking, Brighton, cheese, dinner, fast, Feast, Food, gluten-free, Italian, Vegetarian.